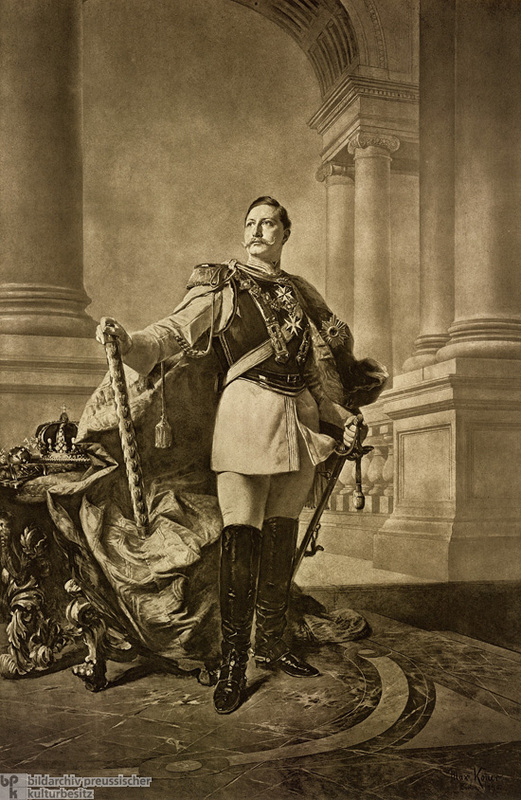 In reality, Wilhelm von Hohenzollern (1859-1941), King of Prussia and Emperor of Germany from 1888 to 1918, was less resolute and imperious than this image would suggest. The painting perhaps better reflects his favorite manner of self-presentation – as part noble sovereign, part military leader. Unfortunately, the public generally focused on the downside of this equation, perceiving him as imperial, haughty, belligerent, and obsessed with military affairs. The Kaiser (here age 31) delighted in posing in his imperial robe, complete with his crown, scepter, and sword, against the backdrop of monumental neoclassical architecture. Together with his frequent attendance of naval and army maneuvers, Wilhelm’s numerous ill-considered comments – including those associated with the “Hun Speech” of 1900 and the “Daily Telegraph Affair” of 1908 – created the impression at home and abroad that Germany had abandoned Bismarck’s postulate of a “satiated" empire and was embarking upon a program of expansion. Painting by Max Johann Bernhard Koner (1854-1900), 1890 (war loss).